Mr Barroso said they had reached a "breakthrough in negotiations" to achieve "a great agreement for both the European Union and Canada". 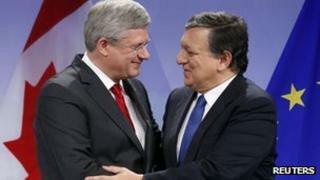 The European Union is Canada's second-largest trading partner behind the US. Mr Harper said the agreement was "the biggest (trade) deal our country has ever made". It will give Canada access to a market of some 500 million people in the EU, making it bigger even than the country's North American Free Trade Agreement signed with the US and Mexico. The commission is negotiating trade pacts with more than 80 countries on behalf of the bloc's members following the collapse of the Doha global trade talks. Did Mark Carney guide Canada to growth?